Join us this Sunday at our Times Square location for the 2014 Brazilian Day Festival. Enjoy our special menu and much more! You will enjoy eight 8-minute dates plus the chance to meet everyone else in three age groups from the 20’s to 60’s. We usually have between 50 & 100 attendees at each event, so there is lots of opportunity to meet, mingle and match with other great singles, just like you! You will also receive delicious complimentary appetizers, fun ice breaker games, a cash bar and lots of raffle prizes. 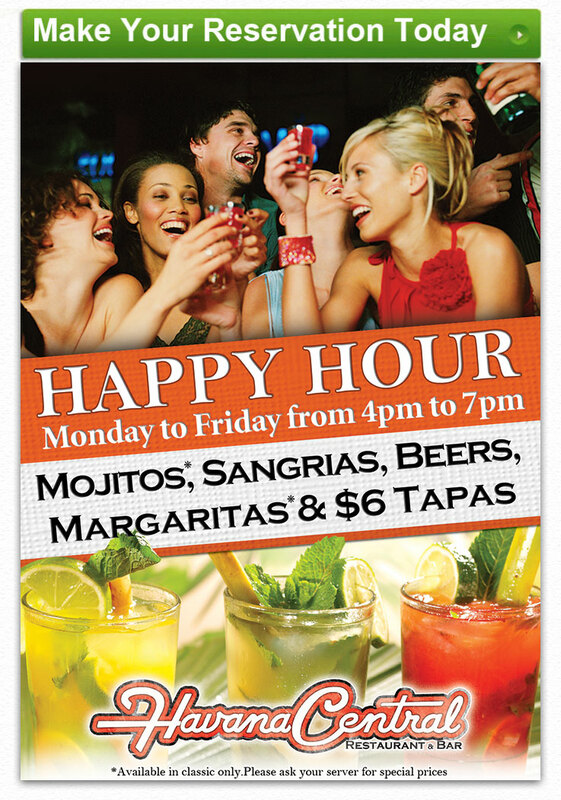 Havana Central’s New Happy Hour! Try our Cadillac Margarita for $7. Made with Don Julio Blanco Tequila. Grand Marnier, Agave & Fresh Lime Juice. Available every Wednesday during Happy Hour. Book your back to school party with Havana Central! Receive a FREE $25 gift card with your next off-site catering order over $200! Have More Fun in the Sun & Less Time in the Kitchen. Let Havana Cater to You!